In December (and even November) holiday and Christmas lights begin showing up hanging from trees, houses and windows. 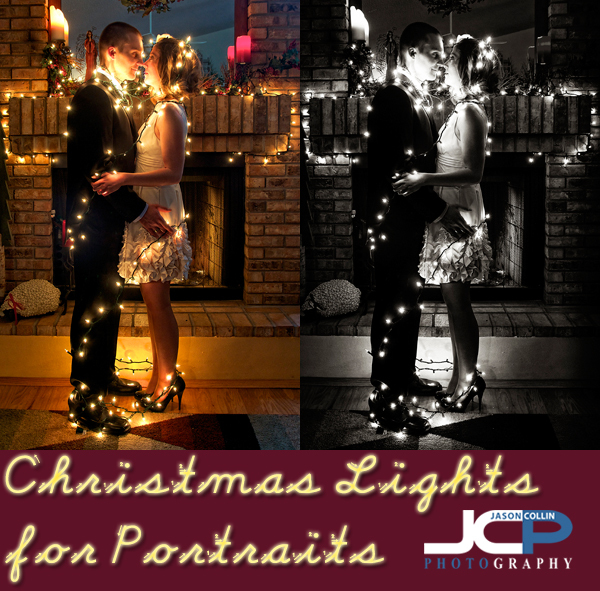 Another use for Christmas lights is as portrait lighting. 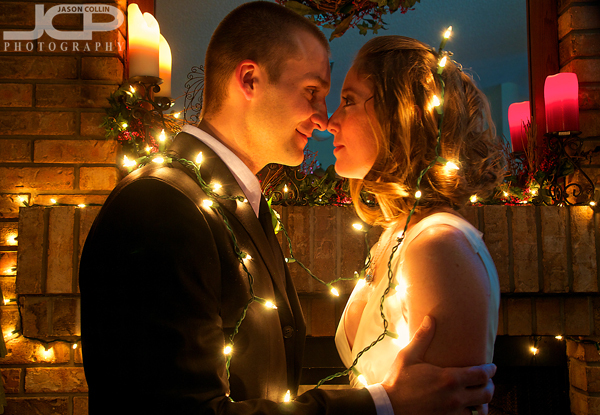 As seen in the above example, I wrapped a string of Christmas lights around a couple from head to toe (but not over their faces) and also the mantle of the fireplace. I used no speedlights and there was only the dimmest of ambient light coming into the living room. In order to get enough exposure I used a shutter speed of 0.8 seconds with my camera tripod mounted. I asked the couple to stand as perfectly still as possible as small movement would create blur with that long of an exposure. Portrait using Christmas lights for creative lighting - Nikon D300 tripod mounted with Tamron 17-50mm lens @ f/5.6 ISO 200 0.8 secSo for creative portrait lighting, try using Christmas lights. Be sure and put a link to your photos in the comments below! 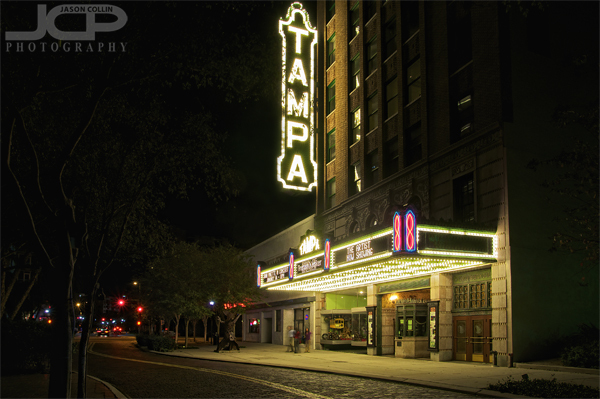 Tampa Theatre glowing marquee & sign at night - Nikon D300 Tamron 17-50mm @ f/11 ISO 200 1 sec tripod mounted with cable releaseContinuing a recent trend of photographing Tampa Bay area landmarks, in particular ones I had never really photographed before, I was glad to finally have the opportunity to make these shots of the historic Tampa Theatre located right in the middle of downtown Tampa. There is no better place I know of to go and have an old time movie experience. As cool as the theater looks on the outside, it is 10x cooler on the inside. It is easy to create images with atmosphere when photographing such a place. 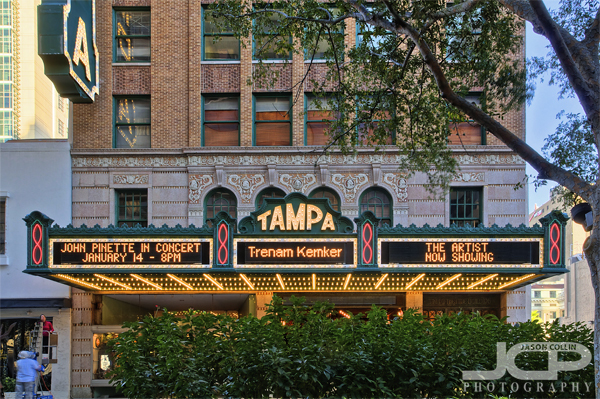 Tampa Theatre marquee in daylight - Nikon D300 Tamron 17-50mm @ f/11 ISO 200 7-exposure HDR tripod mounted with cable releaseI have not actually seen a movie at Tampa Theatre since the 90s, when I used to go semi-regularly. I was living abroad for most of the 00s and since returning to Florida and moving across the bay from the theater, have not made the journey at night to see the more independent movies the theater features. Santa an an elf (?) playing baseball before Christmas!If you were wondering what Santa was up to two weeks before his lone out of home work day, it seems he was out playing baseball here in St. Petersburg. 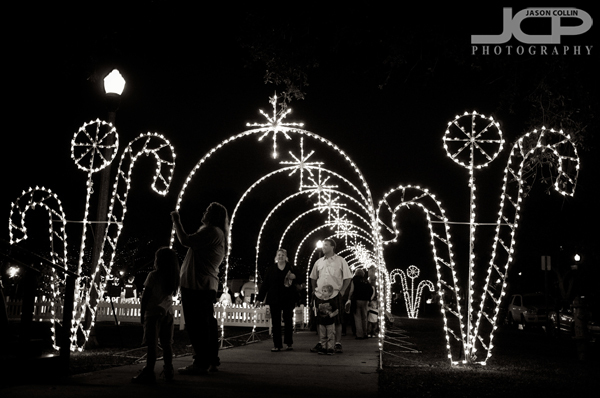 I thought this was a pretty funny subject matter to have Christmas lights for so I was glad I had my DSLR with me. Such photographs can be made handheld no problem as one only needs to expose for the lights of the subject. Having the background remain all black is a plus for a lights shot. What are the funniest, most unusual Christmas or holiday lights in your town? Christmas light tunnel in downtown Saint Petersburg leads to Santa's lap! Christmas in a warm weather place might be hard to make sense of. I know to people who live in cold winter places it must be unimaginable to wear a t-shirt or go to the beach on Christmas Day, but I have done both. It was a very balmy night in west central Florida this evening. It is my goal to put up a series of photographs that tell what it's like to spend Christmas and the holiday season in Florida, a warm winter place. Maybe I can photograph Santa wearing shorts? No ice in Florida, however we do have glice! For now I present a skating rink of glice. From afar one might be convinced it was a true ice skating rink. The sounds coming from the bladed feet of the skaters really did sound like shearing along on ice. If I had any two point moving balance, I may have tried it out myself, but my balancing ability is limited to single objects (skimboards, skateboards) only. Glice is definitely the kind of word that sticks in your head. Maybe because I'm trying to figure out what the "gl" part stands for....glice is half ice and half . . . . ? Glue? Let me know what you think it stands for in the comments below. If you live in a warm winter place, let us know how you simulate cold weather holiday traditions.